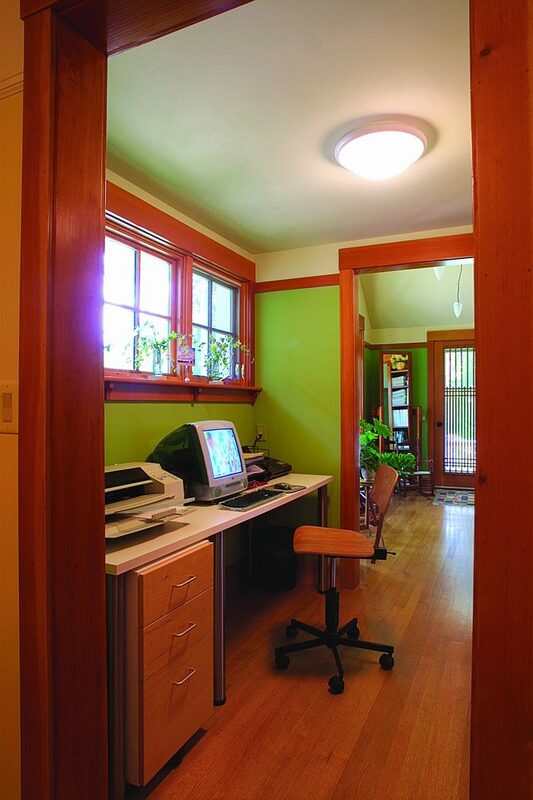 A home office can be as simple as adding built-in furniture or as involved as converting an unused attic. According to government labor statistics, more than 20 million Americans work at home at least part of the time. and the number increases every year. In the near future, chances are a client will ask you about building an office space for their home. Sometimes an existing floor plan can make it hard to accommodate a home office, but rather than enlarging the house, one potential solution is to rework the existing space so that it can accommodate more than one function. 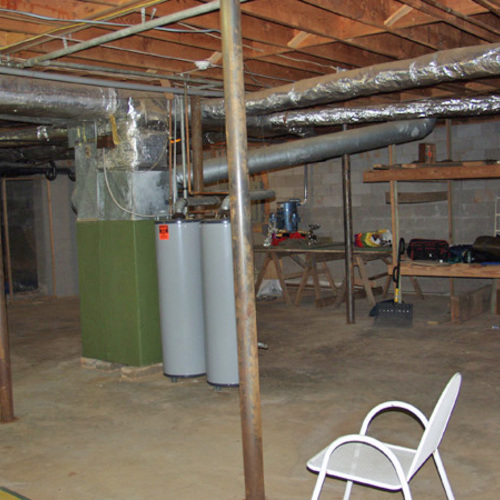 Another viable alternative is to convert at an unused basement or attic into office space. Think ahead about wiring for new technologies or plumbing for future bathrooms while walls, floors and ceilings may be exposed. A careful evaluation of lifestyle patterns and how existing rooms are currently used may be the start of a redesign. Reworking an existing floor plan so that all areas of the house are fully utilized makes more sense than adding square footage. 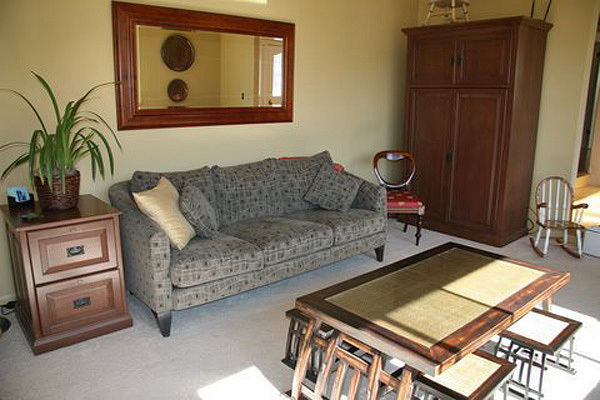 A single room can be reorganized or adjacent rooms joined into a single space. A formal dining room or a living room could serve such purposes. A well-thought-out design can transform a single room into working and living space. Making room for a new home office may be as simple as adding a new piece of furniture. 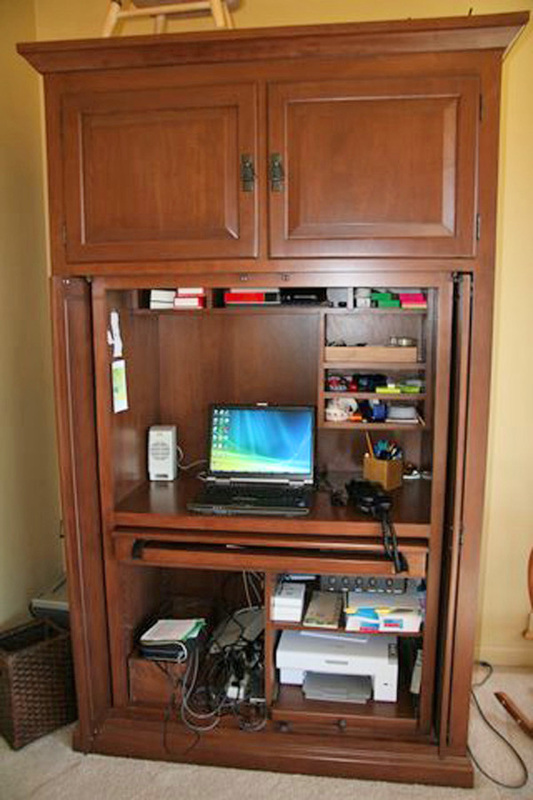 A custom armoire, for example, can open to a computer and office supplies during at-home office time but be closed up when not in use and the room is returned to family time. If there isn’t easily adaptable space in the existing living area of a house that can be converted or used as a multipurpose area to accomodate a home office, take a look at the floor above or below the main living rooms. Converting an unconditioned attic or basement to an office will require addressing the insulation and air sealing, as well as providing lighting and adequate electrical services. Converting either unused space will be more involved and expensive that utilizing another room in the house, but the benefit is that the homeowner will get a dedicated area for an office, rather than having to share with other activities. Solve function or performance problems such as poor air quality, inadequate lighting, poor acoustics or temperature swings and drafts early in the design process. Furnishings and flooring should be compatible with office functions. Choose furniture, flooring and fabrics that don’t emit volatile organic compounds (VOCs), formaldehyde or other contaminants. Choose a mix of natural daylighting, compact fluorescent lamps and task and ambient lighting. Some pieces that lend flexibility to a home office space include a self-contained and easily closed secretary’s desk or armoire with an antique-style desk chair and a coffee table with tuck-under seats for children. Select furniture that has been finished with least-toxic products. Choose untreated, kid-friendly (dark, patterned, textured) fabrics for durability and minimal cleaning. Pam Sowerby’s house had no office space. 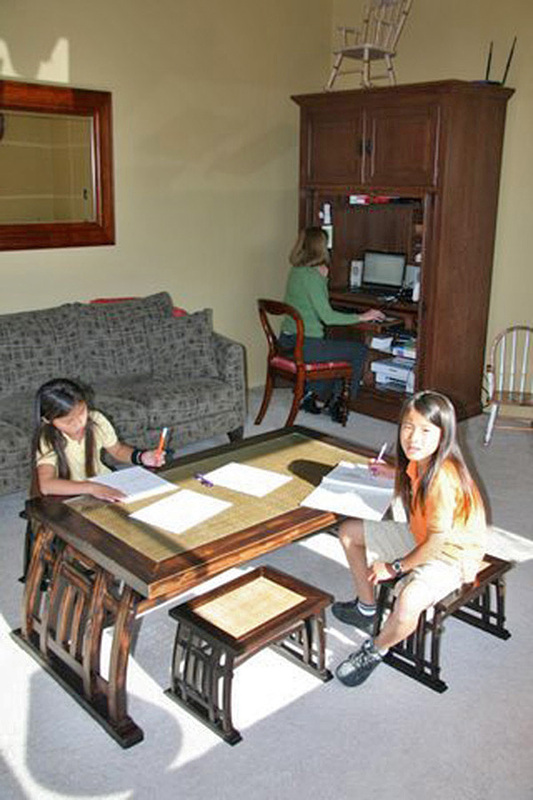 She needed a functioning workstation so that she could work at home while taking care of her children. Her chemical sensitivities made selecting low-emission materials a necessity as well. Pam contracted interior designer Victoria Schomer to turn the living room into a multifunctional and healthy space for the family of four. CARVING OUT A SPACE CAN BE THE FIRST CHALLENGE. In most homes, space is at a premium, even before you look for an area that can work as a home office. This California living room had to work as a family space, a place for kids’ homework as an a home office. Pam wanted to be able to work in the room but also use it as a living room for the family and guests. The kids needed a space where they could do homework and play while she worked. Some smaller-scale furniture was chosen to creatively maximize the uses for this limited space. The desk is a self-contained office space that when closed looks like an armoire. The coffee table comes with four small matching stools that can be used by the children or pushed under the table for an uncluttered living area. MULTI-PURPOSE FURNITURE CAN BE THE ANSWER. 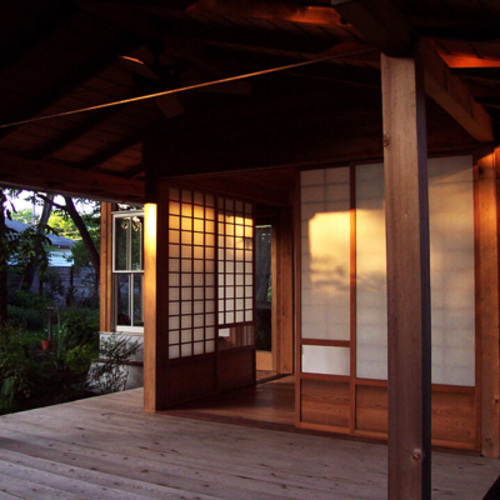 The functions of a piece of furniture can change from day to nighttime. This California living room serves as home-office space and homework area during the day, but at night when the desk is closed and the stools are pushed under the coffee table, the room serves as a living room for for the family. COMPACT, UNCLUTTERED, AND CLOSABLE. Multi-purpose furniture, such as this home-office desk, open to reveal their hidden functions. Furnishings do not always fit a space as anticipated. At first, the filing cabinet appeared too big for the living room. Moving it by the sofa to use as an end table solved the problem. Taking time to really think about the uses of the room—in particular, how Pam uses a desk—helped them design and furnish the room so that it truly met the needs of the entire family. During the day, Pam uses the desk for work and her children use the coffee table and stools when they want to be close to their mother. On Friday evenings, they close the desk, bring in chairs from the dining room and seat a church group of up to 12 people. chemical sensitivities; before any final purchasing decision was made, all furnishings and finishes, including samples of every component going into custom-made furniture, were given to Pam to self-test for a health reaction. Dealing with chemical sensitivities sometimes adds costs. Pam andVictoria had trouble finding a green furniture manufacturer for the kind of desk they sought. They worked around this by ordering the desk unfinished and having a low-emitting finish applied locally. The manufacturer, however, charged the full price for the unfinished furniture. In general, they focused on purchasing good-quality, durable and health-friendly furnishings, and decisions were made slowly to ensure that each purchase would really work. LEED for Homes For gut rehabs including home offices, the space is counted as a bedroom in LEED for Homes. Therefore, it reduces the award thresholds and make it easier to earn higher ratings. I rather have a more private space on my office, it's not too easy to focus at work while having a TV in my room or when I hear member of my family talking. I've been there and it didn't really work for me. I recently remodeled my attic and built an office space. I need to focus now on some office chairs that would fit the the desk space. I think the most difficult purchase for your green remodeling project (at least that I've encountered) is finding eco-conscious furniture. More than just avoiding endangered hard woods, many items are made from plastics whose creation is harmful to the environment, while other items may seem to be created from ecologically conscious materials, but are finished with paints and finishes with a highly damaging pedigree. for info on Green furniture and furnishings. Also keep your ears open for an upcoming webinar with Annette Stellmack on this topic, sometime in December.